On-loan Aberdeen striker Bruce Anderson's double gave Dunfermline Athletic a win that leaves Partick Thistle at the Championship's basement. 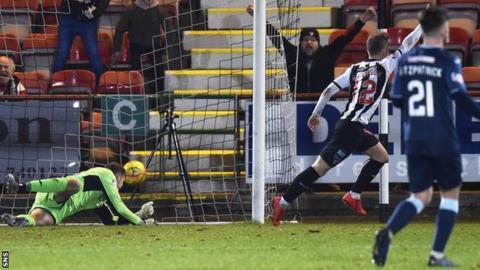 The Pars took the lead from a corner two minutes after half-time, Anderson with the decisive touch after Ryan Blair's delivery was not dealt with. Another Blair corner led to the Pars' second goal as Danny Devine headed home. Anderson wrapped up a convincing win with a close-range finish late on. It was the 20-year-old's third goal in four games for the Pars, who move to within two points of fourth-top Inverness Caledonian Thistle. After a second defeat in a row, Thistle remain behind Falkirk on goal difference but having played a game more. Match ends, Dunfermline Athletic 3, Partick Thistle 0. Second Half ends, Dunfermline Athletic 3, Partick Thistle 0. Substitution, Dunfermline Athletic. Robbie Muirhead replaces Bruce Anderson. Foul by James Craigen (Dunfermline Athletic). Lewis Mansell (Partick Thistle) wins a free kick on the right wing. Craig Slater (Partick Thistle) is shown the yellow card for a bad foul. Aidan Connolly (Dunfermline Athletic) wins a free kick in the defensive half. Foul by Craig Slater (Partick Thistle). Goal! Dunfermline Athletic 3, Partick Thistle 0. Bruce Anderson (Dunfermline Athletic) right footed shot from very close range to the bottom left corner. Assisted by Joseph Thomson. Substitution, Dunfermline Athletic. Matthew Todd replaces Kallum Higginbotham. Gary Harkins (Partick Thistle) is shown the yellow card. Aidan Connolly (Dunfermline Athletic) wins a free kick in the attacking half. Foul by Gary Harkins (Partick Thistle). Lee Ashcroft (Dunfermline Athletic) wins a free kick in the attacking half. Foul by Lewis Mansell (Partick Thistle). Corner, Partick Thistle. Conceded by Joseph Thomson. Corner, Partick Thistle. Conceded by Ryan Williamson. Substitution, Dunfermline Athletic. Aidan Connolly replaces Louis Longridge. Goal! Dunfermline Athletic 2, Partick Thistle 0. Danny Devine (Dunfermline Athletic) header from very close range to the top left corner. Assisted by Ryan Blair following a corner. Corner, Dunfermline Athletic. Conceded by Conor Hazard. Attempt saved. Joseph Thomson (Dunfermline Athletic) right footed shot from a difficult angle on the right is saved in the bottom right corner. Louis Longridge (Dunfermline Athletic) wins a free kick in the attacking half. Foul by Christie Elliott (Partick Thistle). Foul by Louis Longridge (Dunfermline Athletic). Craig Slater (Partick Thistle) wins a free kick in the defensive half. Corner, Dunfermline Athletic. Conceded by James Penrice. Foul by Aidan Fitzpatrick (Partick Thistle). Tom Beadling (Dunfermline Athletic) wins a free kick in the defensive half. Steven Anderson (Partick Thistle) wins a free kick in the attacking half. Foul by Bruce Anderson (Dunfermline Athletic). Substitution, Partick Thistle. Lewis Mansell replaces Scott McDonald. Substitution, Partick Thistle. Souleymane Coulibaly replaces Kris Doolan. Tom Beadling (Dunfermline Athletic) is shown the yellow card for a bad foul. Foul by Tom Beadling (Dunfermline Athletic). Kris Doolan (Partick Thistle) wins a free kick in the attacking half. Attempt saved. Bruce Anderson (Dunfermline Athletic) header from the centre of the box is saved in the top centre of the goal. Corner, Partick Thistle. Conceded by Louis Longridge. Corner, Partick Thistle. Conceded by James Craigen. Foul by Scott McDonald (Partick Thistle). Edinburgh's Hutchison Vale has produced some of the most notable Scottish footballers of the past couple of decades. But what is their secret? Can you name Celtic's Lisbon Lions? Can you name the Celtic XI - led by Billy McNeill - that won the 1967 European Cup against Inter Milan in Lisbon? Pro14 play-off hopes are on the line as Glasgow Warriors host Edinburgh on Saturday. Pick your best team from the two rivals.